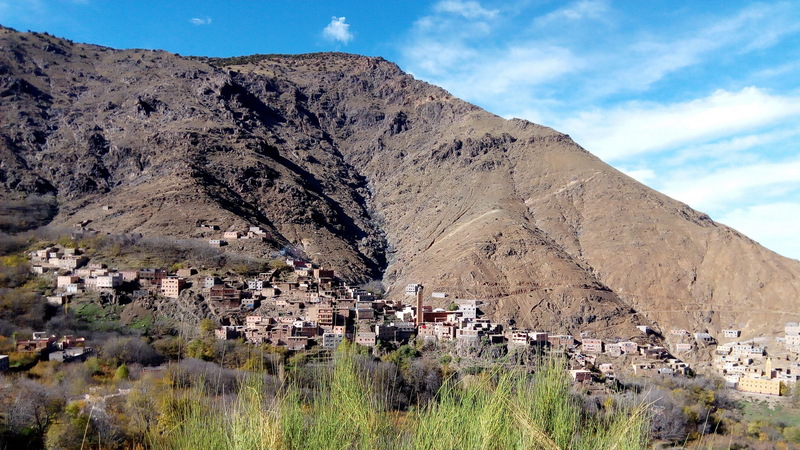 These daily excursions are a great option for those who want to escape the urban noise of Marrakech and chill out a bit amidst the greenery in the heart of the Atlas mountains. Labyrinth of paths, which have been walked for centuries, terraced houses – each of them offering a stunning view to the mountain peaks, passing by the solid walls of the Kasbah. After meeting you at your hotel or riad with your personal driver at around 9.00am, we head south of Marrakech through the Plains of Haouz towards Asni at the foothills of the High Atlas Mountains. We continue south, passing close to the Kasbah Tamadot (now a luxurious retreat and part of the Virgin empire) before reaching the village of Imlil at the end of the tarmac road. When you arrive in Imlil, you will meet with your mountain guide who will take you for a 2 hours trek. You will have the chance to see the local berber villages with a possibility of having a lunch in a house with a berber family. Back to Asni road then kik plateau where valleys follow one another – amazing views. Small stop at Lake Takerkoust before returning to Marrakech at the end of the day.